Kids like toys that have a wow factor. Wouldn't it be fun if a kid can get a 2-in-1 toy? We found a toy for your child. Air Hogs has fun toys for kids. Kids enjoy playing and doing active things. 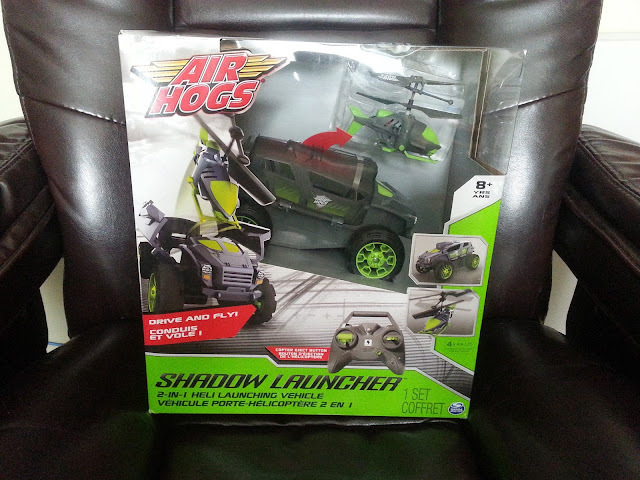 The Air Hogs Shadow Launcher RC vehicle can drive and Shadow Launcher Heli can fly. It's packed with action and can be taken through obstacle courses of adventures indoor or outdoor. My son David likes cars and helicopters. I know he'll be excited to get the Air Hogs Launcher. David will enjoy driving and flying it. He would use it indoors, outdoors and on ground and air adventures. The toy will make David unstoppable for hours of fun and play. The Shadow Launcher requires 4 x AA batteries (not included) and suitable for kids 8+ years. It retails for $37.99. Kids will love to have the Air Hogs Shadow Launcher Heli Launcher Vehicle Drive Fly for a holiday gift. It's a great toy for fun and to explore. To view or buy one visit www.spinmaster.com. Connect with Spin Master for product offers and more on Facebook, Twitter and YouTube. NY MOMSTYLE is hosting the Holiday Guide Event. The Holiday Guide Event Giveaway starts December 4, at 11:59pm and ends December 17th, at 11:59pm. Come back on the day of event to win a Air Hogs Shadow Launcher Heli Launcher Vehicle Drive Fly and more prizes from other brands.